A friend of mine borrowed a cookbook of mine entitled “25 years of brand name baking”. I had recently moved back into my parents’ house and didn’t think I would have many chances to bake. My friend liked to bake and this recipe book had a lot of great ones, so I lent it to her. Then I started an all-baking blog and wanted it back so I could make various baked goods and write about them. So, almost as soon as I got it back, I made Baked Banana doughnuts, which I had rated as a “5” (out of 5) in my notes (sticky notes on the page). They had come out great before and were enjoyed by all who had them, so I figured I’d make them again, and blog about them. Well, the first batch came out more like baked banana cookies. I made a hole in middle as the recipe says, but didn’t space it enough, so the dough spread and closed the hole as it baked. No matter, they still tasted yummy. The next time I made it, I wanted them to actually look like doughnuts because I was bringing them to work. When I work the evening shift, the crew lets me have some of the coffee they make (which they all share in the expense for). Since I don’t work full-time, I don’t share in the expense but wanted to repay them for their letting me have coffee. Since they like to bring/have snacks with their coffee, I decided I would bake something for them. Since we had so many ripe bananas, I decided on the doughnuts. Not only did everyone enjoy them, but no one else had brought snacks so I “saved” the day with the doughnuts. YAY! I’ll share the recipe at the end for those interested. To make sure they stayed doughnut shaped, I placed the dough (which was somewhere between cookie dough and cake batter, texture wise) into mini bundt pans. Yes, I actually have mini Bundt pans. Two that are attached to each other (almost like cupcake pans) and few that are stand-alone. But, They are getting used (sometimes, at least) so…. The next thing I baked from the book was just because I had a hankering for something slightly chocolatey and somewhat sweet that I could enjoy with my coffee. 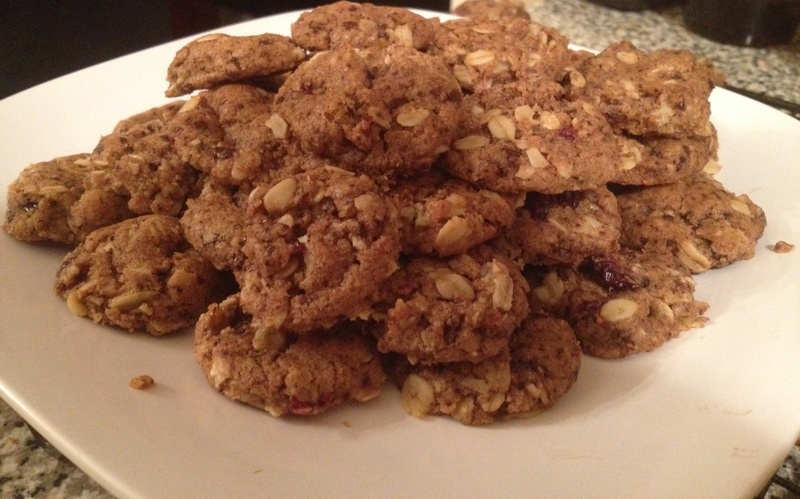 The recipe I chose was another “5”-Peanut butter, oatmeal, cherry and chip mini cookies. In my notes I wrote that I used cranberries instead of cherries (dried), and that’s what I did this time (I didn’t find/look hard enough for dried cherries at Trader Joe’s). The recipe asks for 1 egg or egg substitute, so I used the egg substitute (EnerG). Instead of butter I used coconut oil, reducing it from 1/3 to 1/4 of a cup. And since we did not have any peanut butter, I used almond butter. I baked only about 25 or so, sharing them with various people I was meeting up with during the week, and saved the rest of the dough in the fridge to bake later. Then, a friend of mine invited me for an evening of movie watching/hanging out and I brought the cookies with me. 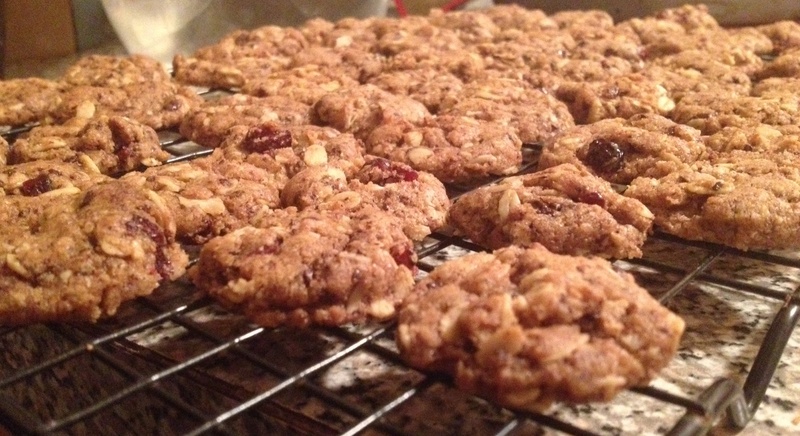 When it turned into a gal-pal gathering/sleepover, I figured I needed to make more cookies. So, I grabbed the dough before going over and baked them at her place. I baked them a lot smaller than the first time since they are supposed to be mini cookies (the recipe says it yields about 96 cookies!!!). My friend loved them, as did the coworkers I shared them with when I worked on the weekend (my payment for coffee again :)). 1. Preheat oven to 425F. Spray baking sheet with nonstick cooking spray. 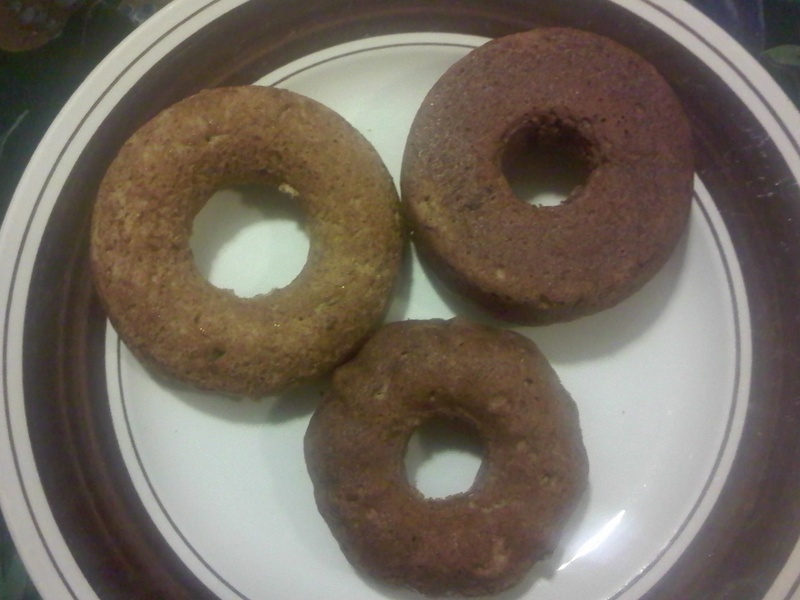 [Used mini Bundt pans] Beat bananas, egg whites, oil and brown sugar in large bowl or food processor. Add flours, baking powder, baking soda and pumpkin pie spice. Mix until well blended. Let stand for five minutes for dough to rise [I think I forgot to do this]. Scoop out heaping tablespoonfuls of dough onto prepared baking sheet. Using thin rubber spatula or butter knife, round out doughnut hole in center of dough (if dough sticks to the knife or spatula, spray with cooking spray). With spatula, smooth outside edges of dough into rounded doughnut shape. Repeat until all dough s used. Sprinkle with granulated sugar and walnuts if desired [I didn’t desire to]. Bake 6-10 minutes or until tops are golden. Makes about 22 doughnuts. Beat granulated sugar, butter, brown sugar and peanut butter in large bowl with electric mixer at medium speed until creamy. Add egg substitute and vanilla; beat until well blended. Add oats, flours, baking powder and baking soda. Beat at low speed until blended. Stir in chocolate chips and cherries. Drop mixture by slightly rounded measuring teaspoonfuls onto ungreased baking sheets. Bake 8 to 9 minutes or until light brown. Let stand on cookie sheets 1 minute. Transfer to wire racks; cool completely.